Ian Riggs brings a wealth of experience within the garden industry to his role as key account manager at Lechuza, the designer of self-watering plant pots. Mr Riggs, who has more than 40 years’ of experience, kick started his arrival with a visit to gardening show Glee. 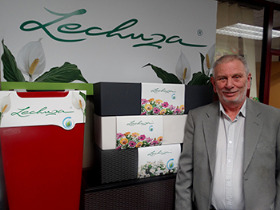 In his new role at Lechuza, he will be overseeing all interaction with buyers for retailers across the country. He will be responsible for growing existing and establishing new relationships with retailers, including premium garden centres and larger independent stores. Within the new position, Mr Riggs is also looking to build relationships with commercial growers. Having been a member of the HTA Ornamentals Committee and the WSGA Executive Committee since 2011, Mr Riggs hopes to use this expertise and knowledge to develop and expand the Lechuza name throughout the UK. His previous committee work involves being a member of the NFU National Horticulture & Potatoes Board and being a former chairman of the BPOA.